August 4, 2016 – Pokémon, Style Savvy, and more drop on this week's Nintendo Download! See all of this week's updates at noon eastern on your favorite eShop. Pokémon Ranger: Shadows of Almia – In the Pokémon Ranger: Shadows of Almia game, you once again play as a Pokémon Ranger, working to help people, Pokémon and nature in a new area called the Almia Region. Starting out as a Student Ranger, you quickly earn the title of a full-fledged Pokémon Ranger. Along the way, you’ll meet and capture all kinds of different Pokémon. Style Savvy: Fashion Forward – Demo Version – Try the Style Savvy: Fashion Forward game before you buy with this free demo. Master five different professions with their own game mechanics and challenges to take the fashion world by storm. Do you know fashion? Put your sense of style to the test! Angry Video Game Nerd Adventures (Wii U and Nintendo 3DS) is 50 percent off (reduced from $9.99 to $4.99) until 8:59 a.m. PT on Aug. 9. Gardenscapes (Nintendo 3DS), Jones on Fire (Wii U) and more games from Joindots are on sale until 8:59 a.m. PT on Aug. 18. Star Wars Pinball is 50 percent off (reduced from $9.99 to $4.99) until 8:59 a.m. PT on Aug. 18. Steel Rivals is more than 25 percent off (reduced from $6.99 to $4.99) until 8:59 a.m. PT on Aug. 25. Midnight 2 is 20 percent off (reduced from $1.99 to $1.59) until 8:59 a.m. PT on Aug. 25. Ascent of Kings is 25 percent off (reduced from $1.99 to $1.49) starting at 9 a.m. PT on Aug. 5 until 8:59 a.m. PT on Aug. 15. SDK Paint and Defense Dome are on sale until 8:59 a.m. PT on Aug. 10. Beatbuddy is 55 percent off (reduced from $8.99 to $3.99) until 8:59 a.m. PT on Aug. 8. Ash is 30 percent off (reduced from $3.99 to $2.79) until 8:59 a.m. PT on Aug. 25. My Pets is 70 percent off (reduced from $24.99 to $9.99) until 8:59 a.m. PT on Sept. 9. Nintendo Download: September 3-9, 2015. Nintendo Download: May 1-7, 2014. Nintendo Download: October 1-7, 2015. Nintendo Download for the week of April 25-May 1, 2013. I may get Angry Video Game Nerd Adventures. Is it good? I'm bummed we still haven't seen Super Castlevania or the Street Fighter games here in the west. Yeah, AVGNA is actually pretty fun! Recommended. Star Wars Pinball is a nice game for anyone who likes both Star Wars and pin ball simulations. I don't have the most recent DLC yet... Wonder if it's also on sale... ... Nope. Has Super CV ever come out on VC? @WrathOfSamus777 Super Castlevania IV is on both the Wii and Wii U Virtual Console, but I believe @sirmastersephiroth is talking about the NEW 3DS VC where it has not been released yet. In the Pokémon Ranger: Shadows of Almia game, you once again play as a Pokémon Ranger, working to help people, Pokémon and nature in a new area called the Almia Region. Starting out as a Student Ranger, you quickly earn the title of a full-fledged Pokémon Ranger. Along the way, you’ll meet and capture all kinds of different Pokémon. This might be the worst professionally-written elevator pitch I've ever read. Is this the best Pokemon Ranger game? I've always been curious about the series. Is this one still HAL? BTW, I forgot how to Google things. What I want to know is when the hell is the games that were picked as Nintendo Selects in Europe coming to NA?! 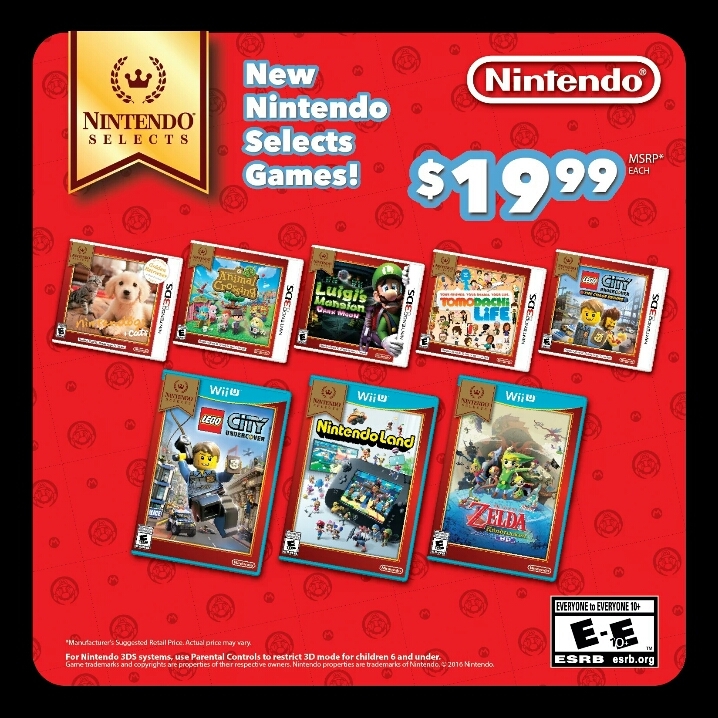 There was an article way back, when these games became 'selects' stating that in about a month NA would be getting those European Nintendo Selects and Europe would be getting the NA Nintendo Selects. I'm having trouble remembering the site, but I think it might of been NWR...not sure. Back in the day, when prices dropped for a Nintendo first party game, whether it was the 1,000,000 sellers on N64 or Gamecube's 'player coice' games, it was typically a worldwide price drop. WTF is Nintendo's problem. Give NA price drops on Zelda WW and that friggin Lego Undercover game that I refuse to pay one penny over $20. Come on, Nintendo, quit being so cheap, (quoting those stacks of money you collect in Conker's Bad Fur Day) ya greedy bastards! Each entity works separately, so you're really just mad at NOA and not Nintendo as a whole. But also, I gotta throw in the obligatory, "Lego City Undercover is worth well more than 20 bucks so just buy it already!" Amazon has it used for a little over $30 right now. AVGN Adventures is okay. It's decently fun if you like both 8-bit platformers and the AVGN in general, but I wouldn't call the game a must-play. For $5, I'd say it's worth it, personally. Just don't expect a masterpiece or anything. I understand that, but still Nintendo as a whole, can still step in and do whatever they please. Seriously, I'm just not buying anymore games right now, because I have such a huge backlog of games to play, and I'm just talking my Wii U, 3DS and even games on my Wii, which are all on my Wii U now. I probably, just on those three systems, have enough games to last me for the next 5-10 years. I know, realistically, that many of those games I'll never get around to playing, especially as newer games I want on my PS4, are released, but at least I'm only buying one game at a time for the PS4, and no more, until I complete each game. Then, with the NX coming out next year, yea I know I said I wasn't interested in another thread, but that was just me, well being stubborn ole me. My bark is alot worse than my actual bite. I'm sure I will be buying the NX, though I'm just not sure it will be right away. Until Nintendo proves why Zelda BotW will be a much better experience on the NX compared to the Wii U version, I plan on going with the Wii U version. If the only differences are less pop-in, more stable framerates , ect., then I'll stick with the Wii U, cause I'm not that nitpicky when it comes to though technicalities. Now, my oldest son, he is the nitpicker, for him, stuff like that takes him ouf of the experience and thats fine. If you are someone who wants a pop-in free game that runs silky, buttery smooth....then go for the NX version. Though, ever since the N64, I've bought every Nintendo console on it's release date, so as time draws nearer to the NX's release date, I wouldn't be surprised if I bought the NX day one ad well....and of course it would be idiotic to have a new console and no game to play on it, so more than likely I'd be buying Zelda on the NX. Whatever route I go, I'm sure I will post about it as well. Haha, it is pretty goofy! What makes it even funnier is that I just spent about 45 minutes yesterday fine-tuning our own eShop write-up for Tadpole Treble next week. It's just 2-3 sentences but they're important to convey the idea of the game. Quick, gamewizard! Wish for Mother 3 in the US! I wish for a console Pokemon MMO. On NX, with online trading, *and* battling. and... I don't want any garbage Fletchling Pokemon, I don't wanna turn into a Pokemon myself, and I don't want any more weird surprises, you got it? ...Mmmm, not bad. Nice gameplay, interesting environments, text speed is a little slow....THE TEXT SPEED IS A LITTLE SLOW!?! Oh foul accursed thing! What demon from the depths of hell created thee?! Some good titles there for people who haven't scooped them up yet! I recommend Luigi's Mansion 2 in particular. Nintendo Land's been sub $20 new for a long time, so that one's funny. Myself, I don't have the Nintendogs game, Tomodachi Life, or Lego City Undercover: The Chase Begins. I'm still not interested in the first two, but I'll probably grab the 3DS Lego City at some point. There are also price drops on Yoshi's Woolly World with amiibo and Mario Party 10 with amiibo, the bundles will be available for $39.99 and joining the selections will be the blue or pink Yoshi for Woolly World, and Peach or Bowser for MP10. Captain Toad will also have a Toad bundle for $39.99, which is the same price as the game itself was, so it's essentially a "free" Toad amiibo. I haven't bought Mario Party 10 yet so I may get one of them at some point. Good post. Made me laugh. But you didn't get the double "and AND" in there. You ruined it.